In this interview we will have a conversation with Frederic Vedrunes, CEO of Piloteo. Frederic is an entrepreneur and a seasoned developer with experience in the financial, building, and supply chain sectors. Piloteo is a good example of the potential of blockchain technology to improve supply chain value for both customers and sellers. More specifically, Piloteo is addressing the operations processes of the local delivery of goods, usually referred as the “last mile” of e-commerce delivery. The last mile is often the most cost-intensive aspect of any product delivery service. It requires making deliveries to final customers over relatively large areas. This involves complicated delivery process automations, renting or owning warehouses, a fleet of delivery vehicles, and the extensive training of employees. Companies are always looking for the best ways to improve efficiency and introduce cost-saving methods to this critical process. Companies like Piloteo are now exploring blockchain technology. 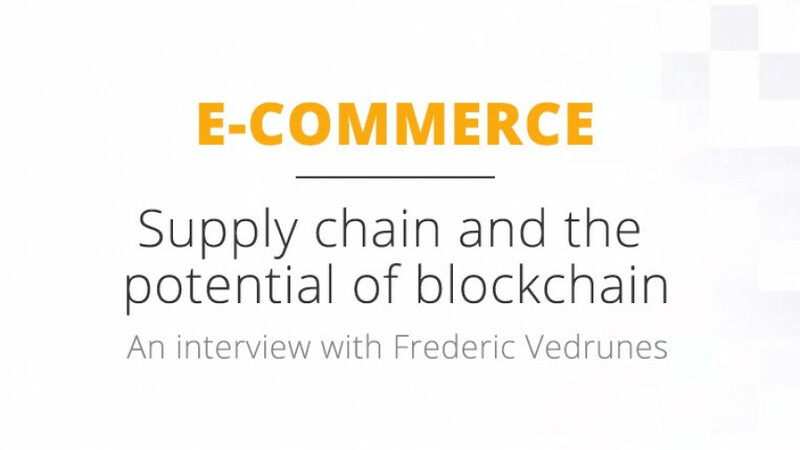 Frederic kindly sat down with E-commerce Decentralized to explain the Piloteo business approach, and how they are tackling the challenges faced by companies who deliver locally. Hi Frederic, how did you get involved in the blockchain industry? Basically, we started consulting mainly to actors of Supply Chain, Facility Management, and Industry sectors. This experience has given us a lot of insights about the potentiality of the blockchain technology in particular for the supply chain industry. We help companies to improve their businesses using the blockchain technology. We also launched a modular platform for Blockchain applications called Smartify.it. This platform combines smart contracts on blockchain technology, real-time data platforms, and IoT (Internet of Things) sensors. We can answer specific needs, such as transferring physical assets with or without deposit, tracking objects or the environment, registering services and business processes on a trusted decentralized ledger, or automating contractual terms execution and financial flows. What is the technology behind Piloteo? You are using Ethereum smart contracts, aren’t you? Smartphone as a smart connected Human Machine Interface with camera, GPS and sensors. Smart contracts for registering business processes, services, pictures, and documents in Blockchain, as well as for managing deposit or invoicing accounts in an automatic and secure way. This allows us to create what we call “smart assets,” with a unique digital identity and public properties like the supplier in the Blockchain. In the case of deliveries, this technology provides a decentralized way to track each package without revolutionizing the user experience or the existing information systems. Transporters use a light-client smartphone app and connect sensors in their truck for temperature control if needed. The idea came from a use case: what can I do if I lose my camera in a hotel on a tourist island far away from my city? Our solution is to use a “delivery smart contract” to manage the deposit of a transporter-traveller in a easy and secure way and without any third party. With the blockchain we can certify transfer and contents of packages and we can automate deposit account management. And with a connected smartphone we can track the package at any time, which allows us to reduce disputes and to easily solve customer’s complaints. We realized in June 2017, with the company Streamr, a prototype based on our concept of a peer-to-peer package delivery. And we demoed at the lastFinovate Europe 2018 our solution for a modern delivery, with a nice feedback from both financial and business managers. The demo is recorded and uploaded to Finovate’s video channel, so everybody can understand the main features and advantages of our solution. Indeed, we have now a MVP of the Smartify.it platform with secure elements we can include in any mobile application. The blockchain business is all about building ecosystems. Are you actively working on that? We offer our services to companies in this emerging blockchain ecosystem and to those who are still exploring the best way to implement a blockchain solution in their business value chain. Our vision is that eventually we will have more efficient businesses due to the blockchain technology. When do you expect to launch the final product? What is your business approach for building a revenue stream with your API? Regarding deliveries, we developed an API for the creation of smart contracts from e-commerce marketplaces. And we work with transporters wishing to modernize their processes and increase customer satisfaction through better tracking and security during the delivery of physical products. We provide technical assistance for the mobile application and we charge a fee depending on the Blockchain and IoT data streams volume. One missing point in many blockchain products is user experience. Many of the current decentralized apps seem really cloggy and confusing to regular users. Are you actively working on UX? How are you “delivering” the best experience to users? Ha! Well, we work closely with every customer in order to design the front-end application and to develop the smart contract following user experience and customer needs. This is done with three main principles in mind: the application has to be efficient, easy-to-use, and secure. Finally, in your opinion what is the main value that blockchain technology brings to the supply chain in general, and to the e-commerce fulfilment in particular? The Blockchain technology brings to the supply chain tangible results as, and amongst other things, tracking of each parcel, reduced fraud, increased customer satisfaction, simplified back-office tasks and better invoice control. Thanks, Frederic. Do you want to add something more? The Supply Chain is probably one of the sectors where the Blockchain technology can create more value for both companies and customers. And we are proud to be involved in this fascinating evolution!